As part of the company's tradition of recognizing and rewarding its top dealers, Raleigh America held its annual Heron Council Meeting and Gala at the Fairmont Orchid Resort on the Big Island of Hawaii, February 2-6. This event, now in its 8th year, is a key component of Raleigh's dealer relationship program that reaches out to its top customers for feedback, and recognizes them for their support of the Raleigh and Diamondback brands. "These dealers represent all that's great in the world of bicycling. They 'enjoy the ride' every day they open their doors, and through their efforts they are helping grow not only their businesses but the sport of cycling as a whole," said Bill Austin, chairman of Raleigh America. "We are proud to be affiliated with each of them and greatly appreciate their support of our brands." This year's Raleigh America Heron Council Dealers hail from biking communities stretching from Wantagh, New York and Madison, Wisconsin to Austin, Denver and Spokane, Washington. There's even an honored member in Barbados. The 25 dealers are: Erik's Bike Shop, Bloomington MN; Agee's Bicycle, Richmond VA; Bike Connection, Palo Alto CA; Taylor's Bike Shop, Taylorsville, UT; Talbot's Toyland & Cyclery, San Mateo CA; Buck's Bikes & Trikes, Austin TX; Brands Cycle Center, Wantagh, NY; Danny's World of Cycles, Scarsdale NY; World of Wheels, Modesto, CA; Bicycle Village, Denver CO; Whippany Cycle, Whippany, NJ; Sunrise Cyclery, Bellmore, NY; Al's Bicycles, Oklahoma City OK; Bicycle Village, Saginaw, MI; Taylor's Cycle Centre, Bridgetown, Barbados; Wheel Sport, Spokane, WA; Bike World, Albuquerque, NM; Budget Bicycle Center, Madison, WI; Bill's Bike Shop, Idaho Falls, ID; Village Cyclesport, Arlington Hts, IL; Bicycle World & Fitness, Harlingen, TX; Off Ramp, Mountain View, CA. The Heron Council annual event combined business with fun in the sun and culminated with a gala celebration dinner and awards ceremony. Raleigh America execs had the opportunity to meet with the top dealers to discuss how the company can best serve the needs of the IBD (Independent Bicycle Dealer) channel. Dealers discussed and compared their views on the future of the industry, and had the opportunity to network with and learn about successful strategies from colleagues across the country. "This award represents the quality of the Raleigh America Team. I feel Raleigh has some very exciting years ahead and I want to be part of it," said 30-year industry veteran Gary Moore of Talbot's Toyland & Cyclery in San Mateo California, "The people behind Raleigh America are a pleasure to do business with. That allows us to concentrate on operating our store and servicing our customers, and not having to be concerned if our supplier is there to support us. They've earned our business. Last year was a fantastic year!" 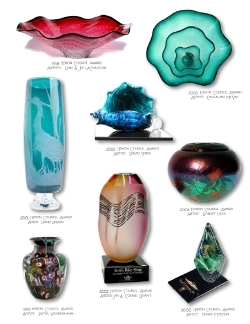 As part of the annual Heron Council gala celebration dinner, Raleigh America has for the last eight years presented each one of its top dealers with a distinctive hand-blown glass award, as a lasting recognition of their performance and support for Raleigh America. This year's award was designed by Seattle artist Callahan McVay and presented jointly by Austin and Steve Meineke, president of Raleigh America. The awards are distributed by Fireborne Corporate Awards of Everett, WA. The unique nature and stunning visual appeal of the awards are emblematic of Raleigh America's deep and sincere appreciation of the ongoing support these dealers provide. said Meineke. "The response to our 2006 product lines has been nothing short of spectacular, and this group is a big part of that. We fully intend to continue providing high quality, innovative products with an eye on value, so they can continue to grow their business, and the sport and pleasure of bicycling." The Heron Council is named after the famous Raleigh Heron head badge which is still placed on the front of every Raleigh bicycle. The "heron" was part of the family heraldic coat of arms of the firm's founder, Sir Frank Bowden. Raleigh America, Inc., based in Kent, Washington, is one of the world's leading suppliers of road, mountain, comfort, BMX and recreational bicycles, parts and accessories under the Raleigh, Diamondback, Avenir and Cycle Pro brands. For more information call toll-free 800-222-5527 or visit www.raleighamerica.com. "Enjoy the Ride". Hi-res images and more information on the Raleigh America Heron Council hand-blown awards are available by contacting info@fireborne.com. Visit www.fireborne.com.